The refreshing quality of potted citrus trees can really warm up a household room and are easy to manage with the right amount of space and access to sunlight. According to TreeHelp.com, all citruses will adapt to containers. However, due to their smaller size, limes, kumquats and calamondins are the best choices for growing in contained spaces. 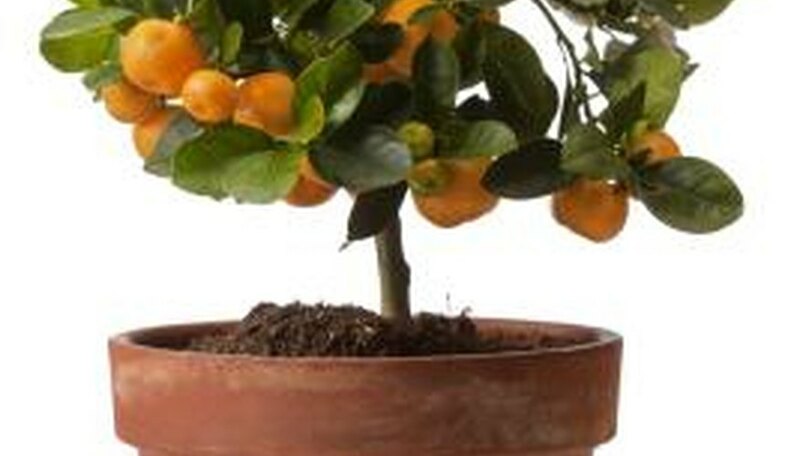 Applying a suitable citrus-specific fertilizer will also encourage a healthy growth for potted trees. Fertilizer spikes can be used on all types of fruit and citrus trees. For the best results, they can be used once per season, ideally in the early spring and mid autumn. The spikes should be inserted near the trunk of the tree about 2 inches below the surface of the soil. They are environmentally friendly and pose no health risk to humans or animals. Dynamite Plant Food offers a variety of products for fertilizing a healthy garden, including Palm & Citrus, which produces vibrant fruit and green palms for potted citrus trees. The formula contains balanced rates of nitrogen (N), phosphorus (P), and potassium (K) and feeds up to nine months. To produce healthy fruit and leaves, citrus trees require NPK, as well as other micro-nutrients like Magnesium, Copper and Zinc, which are not always found in manufactured fertilizers. Mycorrhizal fungus is one type of natural fertilizer that lives in the root system of most trees, allowing the common nutrients in the soil to reach the tree. Although mycorrhizal fungus is usually found in a tree's natural environment, it might have to be added to the soil of trees that are grown in containers. To fight iron deficiency in trees, which can result in weak and yellowing leaves, chelated iron tablets can be placed directly into the soil of a potted tree. The tablets will slowly release iron that can be absorbed by the tree and balance pH levels. Melanie Sevcenko has been a professional freelance journalist since 2008. She has written for several international publications, including "DOX Magazine," "POV," "Reascreen" and other European newspapers. She has also worked for a number of international film festivals and nonprofit organizations for documentary cinema. Sevcenko graduated with an honors diploma in film production from Humber College in Toronto.